Whether it’s a critical process running on a server or an application on your desktop – sometimes processes terminate and need to be restarted – immediately. With EventSentry & EventSentry Light you can do just that: Automatically restart processes immediately after they terminate. 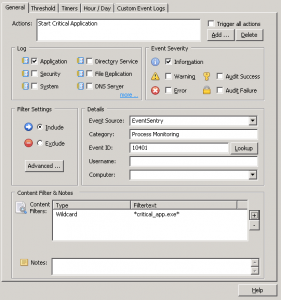 In the past, one drawback of EventSentry launching a process was the side effect that any process started by the EventSentry agent would run under the same account as the EventSentry agent itself (usually a privileged domain account or LocalSystem). In this post I’ll discuss how you can work around that limitation in a secure manner using a scheduled task. When the critical process fails, instead of launching the process directly through a process action, EventSentry will trigger a scheduled task instead. Why? 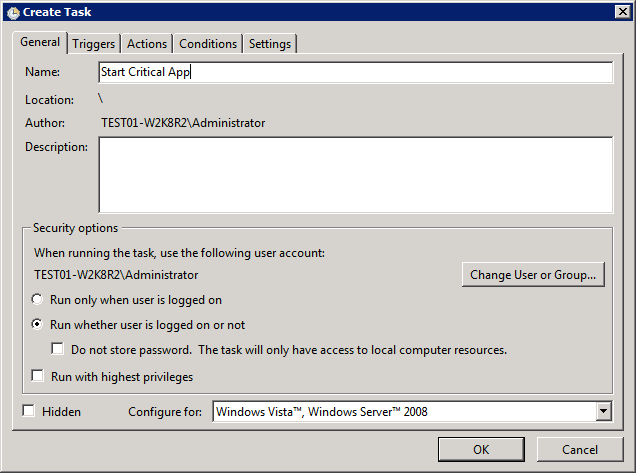 Because scheduled tasks allow you to configure under which user a task will run – and the user’s password is securely stored in Windows. Let’s look at this in detail. 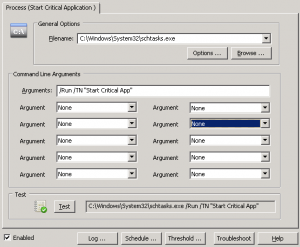 First, on the host where the critical but unstable task is running, you create a schedule task in the Windows “Task Scheduler”. 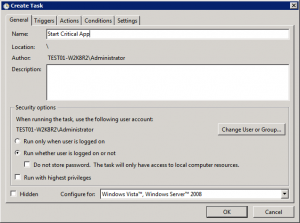 Under General, give the task a descriptive name (“Start Super Important App”) and change the user under which the program should be running under. 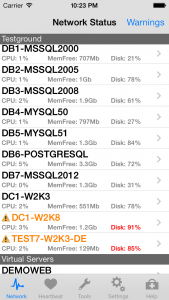 In most cases you will also want to make sure that you configure the task to run whether a user is logged on or not. Then, under “Actions”, add a new action “Start a program” which points to the executable that should be launched. After you click “OK” you will be prompted for the password for the user. 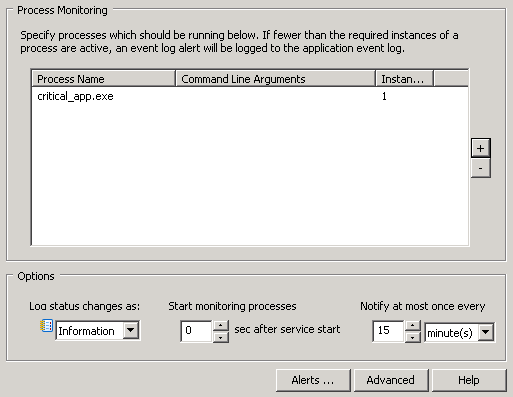 The next step is to setup process monitoring in EventSentry. Right-click “System Health” and create a new package and assign it to the computer(s) in question. Right-click the newly added package and select “Add – Processes”. Click the newly added object and add the name of the process which should be monitored. You can configure how many instances of the processes are required, and with which severity the event will be logged when the process is inactive. 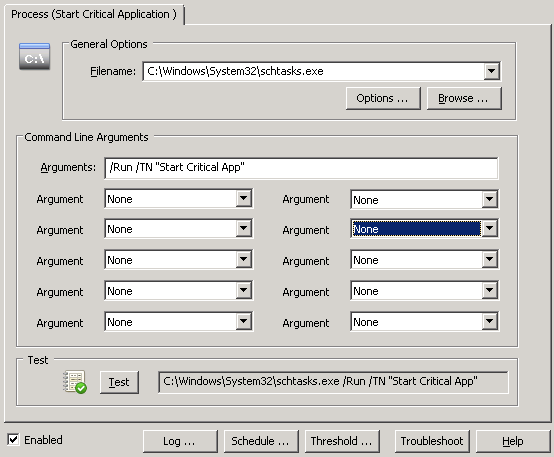 This uses the built-in Microsoft utility schtasks.exe to run the task we created in our first step. 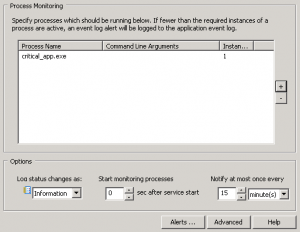 At this point EventSentry will monitor the specified process and log an event if the process is inactive. And while we do have an action to trigger the scheduled task, we still need to tell EventSentry when to launch that action. Important Notes: The event severity will need to match whichever severity you selected when adding the process monitoring object in the system health package. The content filter can also be configured to match insertion string #1, in which case the wildcards are not necessary. And that’s all there’s to it, simply save the configuration when you are done. If the process is running on a remote host then don’t forget to push the configuration to that host. 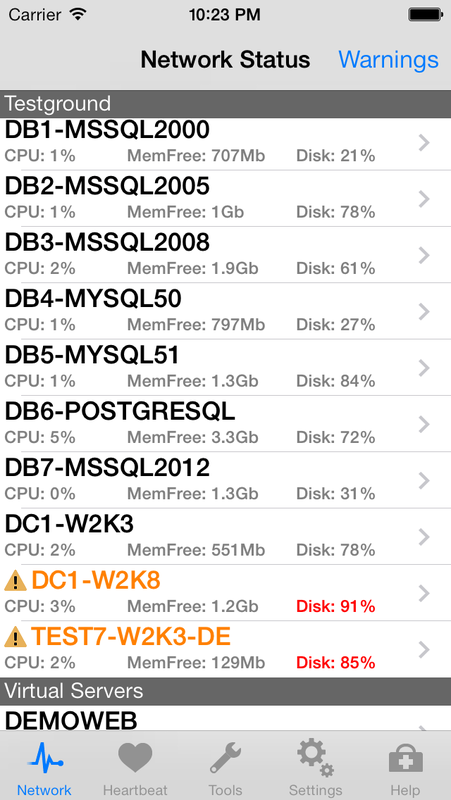 EventSentry Mobile v1.3 for iOS Available! We’re excited to announce EventSentry Mobile v1.3 for the iOS platform. 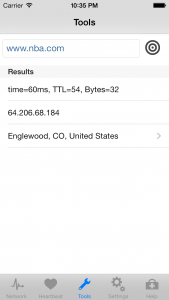 The new version remains free, is optimized for iOS 7, sports a refreshed interface and also includes a brand-new feature for pinging hosts in real-time. Since the new version of EventSentry Mobile was optimized for the new web reports in EventSentry v3.0, it will not work if you are running EventSentry v2.93 on your network. 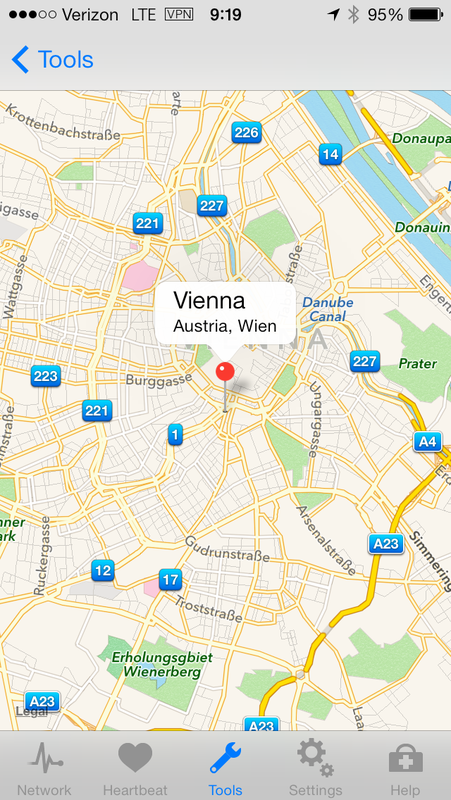 The interface of the app remains largely the same, but integrates more seamlessly with the iOS 7 flat look. Icons on the network status dialog are now only shown when a host is at least in a warning state, and the icons on the heartbeat dialog have been changed to new flat icons. 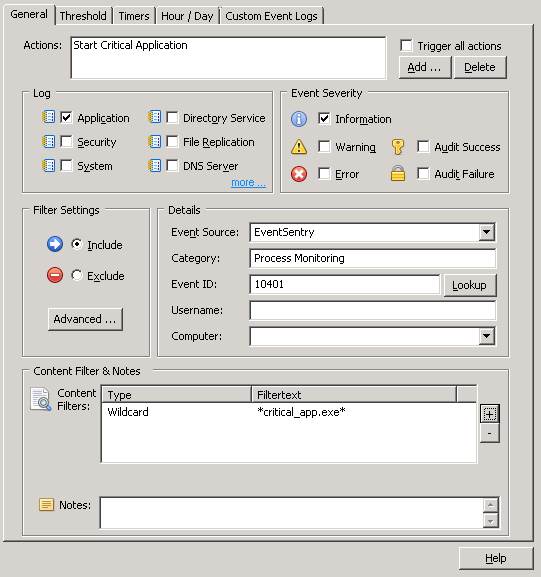 Viewing computer details has been tweaked for hosts which are monitored via SNMP since there is currently less information available when compared with Windows hosts monitored by the EventSentry agent. The tools dialog has a single input field with one button where you can enter either an IP address or host name. After you enter the host name or IP address and click the target button, the web reports will ping the host, perform a DNS (reverse) lookup and try to obtain GEO information. 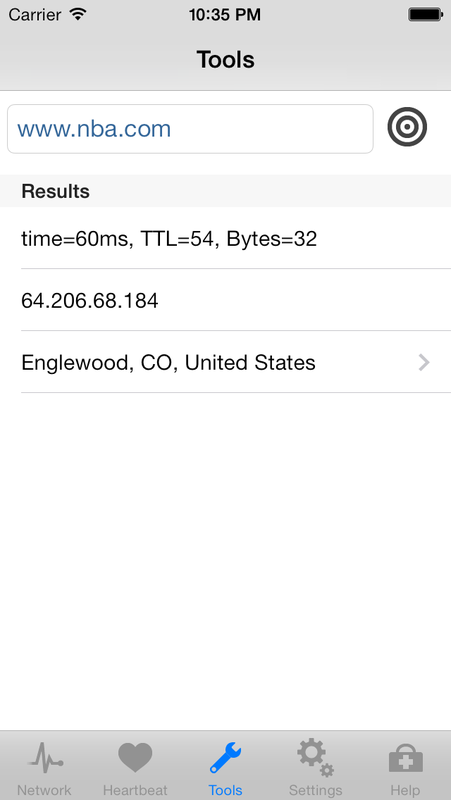 The ping and DNS lookup are performed from the web reports rather than from the phone directly, GEO data is pulled by the iOS device from http://freegeoip.net/. If the IP address is not private (e.g. 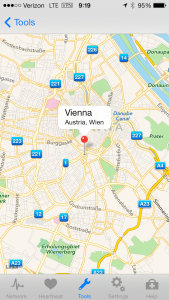 192.168.1.x) and coordinates are available then the location can be viewed on a map directly on the iOS device as shown below. Reminder: If you are using EventSentry v2.93, iOS 7 and have automatic updates enabled on your iOS device, then EventSentry Mobile will stop working. If you have an iPhone or iPad and haven’t already installed EventSentry Mobile then simply search for “EventSentry” in the App store or click here. Enjoy!